This time of year, I always think about what is coming in the landscape. Summer heat is done. We have the warm days and cool nights that are great for sleeping. We have the Autumn leaf colors to look forward to seeing. 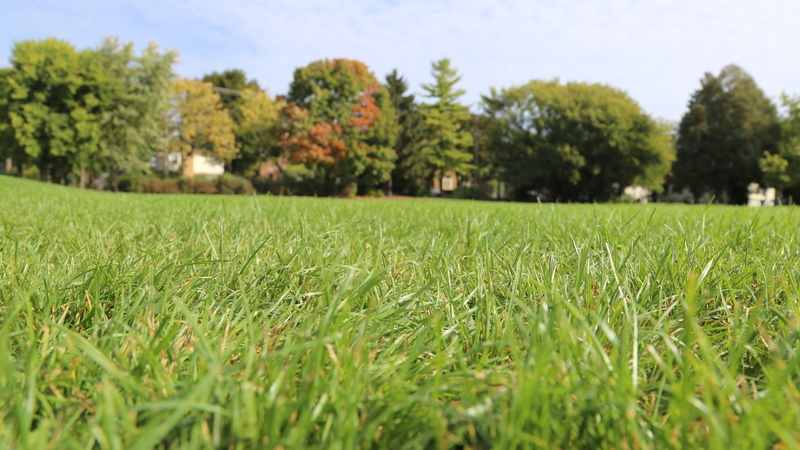 The falling leaves and the cooler temperatures give us a great opportunity to prepare our lawns for next year. The leaves that are on your turf can cause a great deal of problems if you let them cover the turf all winter. One of the easiest and best things you can do with them is to run them over with your lawn mower. Use your lawn mower to grind them up into small pieces and evenly spread them in your turf. The small particles will work their way down to the soil and decompose. This adds free organic matter to your soil. The organic matter keeps the soil more resilient to weather extremes by helping with water storage and oxygen exchange. It also gives soil the soft “bounce” that you can feel walking on healthy soils. Mowing/mulching your leaves saves you the cost of disposing of them. When leaves are picked up by the city or disposal company, the leaves are composted and sold back to the public as vegetative compost. This is a very good additive to your gardens-but why give it away when you can DIY in your own yards! Don’t let piles of leaves or other debris sit over the grass for the winter, it can kill the grass beneath the pile. Fall is also a great time to fertilize your yard. An excellent time to fertilize your lawn is on one of the nice days that come between Halloween and Thanksgiving. Even though your grass is not growing, it is still alive and will store the nutrients for use in the spring. You will get a very early and deep green lawn sooner than your neighbors!